Home › Fix My Smile › What is the Teeth Tomorrow Bridge to Tomorrow? It’s no secret that many adults don’t go to the dentist often enough, a recent study showed that nearly 1/3rd of U.S. adults haven’t been to the dentist in over one year. While fear of the dentist is a major factor, often it comes down to an inability to pay for proper dental care. Letting minor dental problems go untreated in the present allows them to become even costlier major dental issues in the future – a future with no true Bridge to Tomorrow. It’s all too easy to feel like you’re stuck in a Catch-22 in that scenario. How can you avoid more painful and expensive dental work down the road if you can’t even pay for the care you need right now? There might be plenty of temporary “quick fixes” offered to you, but you need a more stable and reliable solution to your missing and failing teeth. 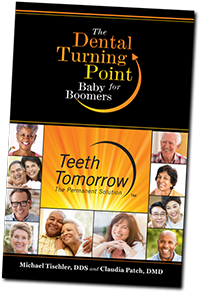 Thankfully, there IS a solution that’s both affordable and proven to work – the Teeth Tomorrow® Bridge to Tomorrow™! Bridge to Tomorrow™ is based on the same effective and groundbreaking procedure that has allowed Teeth Tomorrow® to produce life-changing results for thousands of patients, providing you with a full set of upper and/or lower teeth supported by dental implants. This 21st century solution, designed specifically to fit your budget, sets the groundwork for your path to restored oral health and provides immediate relief for the pain and shame of missing or failing teeth. You no longer have to worry about messy adhesives or ill-fitting dentures, as your Bridge to Tomorrow™ dental implants are ideally placed to attach the final, stable dental bridge of your choosing! In addition to its affordability and ease of placement, the Teeth Tomorrow® Bridge to Tomorrow™ also gives you the freedom to choose the dental bridge that works best for you. After your dental implants have had time to integrate to the bone, they can hold a set of Bridge to Tomorrow™ teeth and eventually be upgraded to a Prettau® Zirconia full-arch bridge. Now you can afford to change your life and have a smile that fits your needs and budget today, without limiting your future tomorrows! Get the results you need, within your budget, without compromising – schedule your initial consultation with us today!